The Insurance Regulatory and Development Authority of India (IRDAI) has asked Life Insurance Corporation of India (LIC) to submit a comprehensive response on 'serious' allegations made by Moneylife Foundation in a memorandum on how the Jeevan Saral policy has rampantly mis-sold with the claim that it would offer excellent returns, while in fact, older policy holders stand to lose a big chunk of the principle invested over 10 years. Moneylife Foundation had sent a copy of the Memorandum to the Finance Minister as well as the insurance regulator. The financial services department in the ministry, which looks after insurance matters, on 28 September 2018, forwarded the Memorandum to IRDAI asking its chairman to take appropriate action. It has also asked IRDAI to inform the ministry about action taken (on the Memorandum) with regard to the Jeevan Saral policy and inform both, Moneylife Foundation and the ministry. Moneylife Foundation has also received a one-line reply to its memorandum from the LIC chairman VK Sharma today, which says, "We appreciate the concerns raised by you in your letter dated 1 October 218. It will be dutifully looked into." In addition to these actions, a Right to information (RTI) application had been filed with the insurance regulator to check for action on the Jeevan Saral Memorandum. In response, IRDA has provided its letter to LIC which says, "The allegations made by the complainant (on behalf of Moneylife Foundation) are of serious nature. Therefore, you are directed to submit a comprehensive response addressing all the issues mentioned in the complaint on or before 5 October 2018." All this holds out some hope for Jeevan Saral policyholders who have been running from pillar to post for redress. Following a comprehensive and hard-hitting cover story by Moneylife magazine (Read: Will LIC Be Made To Pay for the Horrible Mis-selling of Jeevan Saral?) several policyholders have been writing to us to take up their issues. Some have approached consumer courts and obtained orders against LIC. However, as is the drill, LIC tends to drag all matters to higher forums including the national commission. This is a time consuming process and many policyholders are beginning to lose heart and exploring the possibility of a class action against LIC. 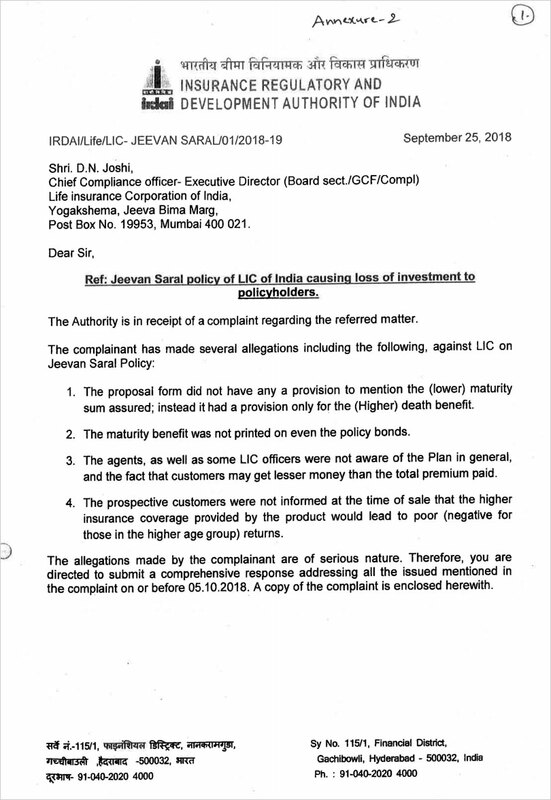 The Jeevan Saral product, which gobbles up hard-earned savings of policyholders (especially senior citizens) have also agitated LIC agents and their association. Despite innumerable letters, protests and objections, LIC has not budged so far. It remains to be seen if it will now be pushed to do the right thing and recall a bad product that has deliberately cheated policyholders. In the memorandum sent to IRDAI on 18 August 2018, Moneylife Foundation pointed out that Jeevan Saral (with profit), a traditional policy, has caused senior citizens to lose as much as 65% to 70% loss of the money invested over 10 years. 1. The proposal form did not have any provision to mention the (lower) maturity sum assured; instead it had a provision only for the higher death benefit. 2. The maturity benefit was not printed on even the policy documents. 3. The agents, as well as some LIC officers were not aware of the plan in general, and the fact that customers may get lesser money than the total premium paid. 4. The prospective customers were not informed at the time of sale that the higher insurance coverage provided by the product would lead to poor (negative for those in the higher age group) returns. The higher insurance cover provided by Jeevan Saral policy essentially worked as a good sales pitch. The buyers were not informed that the product would give poor returns due to the same reason as the investment component was low. To make matters worse, the product gives negative returns for those in the higher age group, although said person would have purchased the product for investment purposes. Even a younger person will barely get premiums back at maturity; hence, Jeevan Saral is a bad investment product. As highlighted by Moneylife, LIC's Jeevan Saral, which used to be a hot-selling insurance product for agents, until it was withdrawn, is a toxic product. In fact, Jeevan Saral was a traditional product that could make your premium (money paid) disappear! It happens during policy surrender or making it ‘paid-up’; but, in the case of Jeevan Saral, it has happened even at policy maturity. A senior citizen couple got just one-third of the premiums paid over the years. "For example," the Memorandum said, "A 58-year-old person, paying half-yearly premium of Rs4,076 for 12 years, had paid a total of Rs97,824. The maturity sum assured, which was paid to him after 12 years, was a mere Rs24,575 plus bonus, amounting to Rs34,405. Even though the maturity amount was mentioned in the policy document, it was missing in the proposal, which only specified the death sum assured of Rs1.25 lakh. As the proposal did not mention the pathetic maturity sum assured, it tantamount to mis-selling by LIC itself. The policy was sold with inaccurate and misleading proposal form!" Taking advantage of gullible Indians blindly buying LIC’s products, the behemoth sold a toxic product, with the misnomer Jeevan Saral (meaning ‘life simple’), which became a hot-selling insurance product for agents, until it was withdrawn in December 2013. The product ran for nine years selling almost 50 million policies. Will LIC Be Made To Pay for the Horrible Mis-selling of Jeevan Saral? Mr. Bhaskar its very good that you are connected to LIC for 2 decades but when we can see LIC becoming more transparent with respect to their policies like online purchase of policies etc. like other insurers. LIC was having good reputation but of late they have started duping the customers badly. Either they have no control on their agents or LIC itself is encouraging agents to sell or mis-sell their policies at any cost whether it is good for customers or bad. As long as LIC is benefitted its fine with them. I bought two Jeevan Saral policies and agent showed me a table showing more returns that a Post Office RD. But now i have found that LIC is not recognising that table itself. That means agents are printing their own table booklets just to make their money and cheating the customers who have faith in LIC. Please tell me what LIC is doing about it if you have any update. Is there any update from IRDA on Jeevan Saral policy (SCAM)? IRDAI should ensure that policyholders should not get cheated by LIC or any other insurance company which used to happen before IRDAI was not on the scene but if the same thing is happening now then it is very regrettable. In my view IRDAI should pass instructions to LIC and compensate Jeevan Saral policyholders immediately since they were cheated when selling the product which is an offence. Premium deduction for the balance period in completion of year in case of death claim does exist with all Insurers. Actually the premium is supposed to be paid in yearly mode only but for customer's convenience it is also charged in monthly, quarterly, and half yearly modes. Hence is a person dies in between, the premium for the rest of the year is deducted from the claim amount paid to the benificiary. I appreciate your generosity in defending LIC as you are a LICian from last two decades. Tell me abt LIC's practice of writing heaps of cheques without claim papers and posing them as claim paid for all the purpose? Like IL&FC, LIC itself carries lots of bad assets. They have a habit of absorbing and covering up bad loans like their acquisition of IDBI. IDBI is loaded with bad loans. As far back as 2007 they tried to unload on our Fund bad loans made to relatives of then Minister Chiddambaram relatives as well as "repeatedly rescheduled" loans to Younger Mittals various "mis-adventures". Lic plan 165 Jeevan Saral for 10 years their matuty comes less than paid premium. What do i do to get higher premium. LIC is not collecting true premium from the subscribers. The annual premium, is collected in instalments --monthly,once in three months, six months and yearly. In the case of death cover paid, they deduct the unpaid instalment premium due under the policy.I do not understand why the unpaid instalment premium should be deducted when there is no unpaid premium due. eg. Let is presume dt. of commencement is 01-04--2017 with quarterly mode of premium payments. The pre.due 1-4-18 is paid and the policy holder dies on say 5-6-18. when the calim is settled, they deduct the premium due on 1st of July18, october'18 and january 2019 and pay the balance to the beneficiary. why should they do so? Premium is paid in advance for a year. So even premium mode is Mthly , qly or hey premium for one year will be deducted in death claim. Do you plan to join the 25 million Indians who travelled abroad in 2017, with the number expected to go up to 50 million by 2020, and will you be securing your risks and liabilities by taking all risks travel insurance – voluntarily, by choice or because the destination countries insist on it? And if so, will you, like almost all these 25 to 50 million people, buy your travel insurance from an Indian company? My wife is a frequent global traveller and we, typically, pick up a multi-entry multi-trip all risks travel insurance for the whole world. The one we picked up last was Tata-AIG multi-platinum 45 days, which meant top of the line coverage, for all trips anywhere in the world not exceeding 45 days each. The validity was from 13 September 2017 to 12 September 2018. In the cover note (incidentally, we never received the full insurance policy document) was a line to the effect that an automatic extension of seven days was part of this policy. This policy cost us about Rs15,000 for a full year, no single trip to be more than 45 days. My wife left India for various countries on 2 August 2018 and was scheduled to return on or around 24 September 2018. Allowing for 45 days + 7 days, and a renewal when due, we thought we had the travel insurance well in place. Around the end of August 2018, we received a reminder for renewal dated end July 2018, by hard copy and also by email, quoting the policy number in the subject line. The renewal cost was just about thrice the cost of the original policy, all other parameters remaining the same, except that my wife had entered the 61-70 years’ age band from the 50-60 years’ band. The renewal was going to cost me about Rs45,000. a) Wife is travelling and needs extension from 12 September 2018 onwards. b) How do we resolve the 45 days’ limit. c) Why is the premium so high? I was told that for renewal, she would have to return to India before the expiry of the policy on 12 September 2018. For resolving the 45 days’ limit? they said there is no solution, because the seven days automatic renewal applies only if a flight is cancelled and there is no alternate flight option. And as for the premium being high, I was told that is because she has gone into the next age band. There was one solution I discovered on the Tata AIG website - I could reduce the cover from Platinum to Gold and the duration from 45 days to 30 days, at which level it would be a more reasonable Rs23,000 or so. This I discovered online on the Tata AIG website without any help from Tata AIG. However, before all this, I was given a huge run around because I was told that the policy number was incorrect. After a few calls, I finally got through to somebody who then told me that the policy number had been changed because of the internal migration policy of Tata AIG, and they did not think it fit to mention the changed policy number to me even in the renewal letter. Imagine the effect of this practice if one is trying to make a claim abroad. Or if any of the immigration authorities had tried to re-verify the policy or the cover note. The long and short of it was that I was told that unless my wife returned from Europe to renew her travel policy, her movements to other countries en route back to India were going to be cut short as she would be without insurance cover while travelling from one country to another, and that any solution by Tata AIG was simply not feasible. And for any change in policy terms or a fresh policy – “you got it right, Madam will have to return to India,” is what I was told. More than anything else, this was informed to me over phone by the call centre staff in the same tone of voice and attitude that they reserve for denying a claim. A "Do what you wish" kind of message being voiced over the phone. They may have assumed I was talking from abroad. It was at that juncture, that a person who is an even more frequent traveller, suggested that we look at picking up a short-term two-week policy from abroad, from destination countries, directly. It took me less than 15 minutes online to pick up a fresh cashless policy for the missing period: 12th to 24 September 2018, for all of Rs1,200 or so. With a direct cashless linkage by the insurance company in their own home country to hospitals in their own country. The only condition was that the policy needed to be bought one day before travel. In addition, the age band for senior citizens in their case started at the end of the 64th year, i.e., on the 65th birthday. I did not even have to attach any ID or age proof. Just name, nationality, date of birth. When I called up their call centre, I was told that they assumed we are filling the truth in the online form and, if we are not, then not only would the claim be in jeopardy but it would also be considered a serious attempt to defraud by forgery. What about previous ailments, I asked over the phone and was told that, the policy was only for 15 days and covered any medical problem in those 15 days other than dental treatment not caused by an accident, full stop. The policy issued by Tata AIG in India has lapsed. I am now bombarded by calls and reminders to renew or revive the policy. One of them even quotes the seven days extension. On the other side, middle-level management are busy throwing fine print at me on why they cannot bend from their policies in facilitating an extension or renewal. And more interestingly, how the seven-day extension is simply not feasible. The policy issued abroad is signed by a human being who also appends his local regulatory authority's ID number as well as his competence and qualifications. Insurance Regulatory Development Authority in India (IRDAI) also has a similar clause, but I have yet to see anybody (other than old-timer insurance agents and government insurance company staff) contacting me from an insurance company in India, quoting the IRDAI certification number. you mentioned \" policy issued abroad is signed by a human being who also appends his local regulatory authority\'s ID number as well as his competence and qualifications. \"
how was this possible if you bought this policy online? I am traveling to Singapore only on 15th October for a week. I searched for inbound travel insurance and I am unable to trace any. Would you be aware of any agency providing the same? Also, some travel agents try to insist that only insurance bought from an Indian company is valid, esp when applying for a visa. This is false. The other aspect to keep in mind is the difficulty of getting a cashless claim abroad if using an Indian policy. Mr. Veeresh Malik, Does the foreign Insurance Company cover the existing disease? Please also note that I am a senior citizen. Please also name two three insurance Companies in USA, who would insure. Sir, each country, each insurer, each policy will have different terms and conditions. You would have to research this on your own, online, well before departure. All I am saying is this - an "inbound travel insurance" tends to work better than an "outbound travel insurance" from point of view of layers of incompetence. Recently, during my visit to UK, i faced an insurance problem and realized that when travelling abroad, buy insurance from the foreign insurers as they r more aware of the working of their healthcare industry. My 10 month old son contracted chickenpox during our visit to UK. Since UK has an NHS driven healthcare, we walked in at one of the centres, were quickly attended to, diagnosis given and were told the remedial measures that need to be taken. However, the problem started wen the airline told us they wont allow us to travel without a fitness certificate or we will hav to wait for around 12 days before travelling back. NHS under it's rules could not issue fitness certificate. So, a private doctor was reqd which is quite expensive. Besides, extending our stay meant extending the insurance. We didn't want a situation whr we r uncovered n contract something. Talking to the Indian insurers n explaining the situation was turning to be difficult. It didnt help that our insurer had Spain as their service centre for UK related issues (communication wasn't easy). Our insurer was an Indian govt agency. Its site facilitated taking insurance but not extending. The Indian helpline worked only Monday to Friday. We were originally scheduled to travel back Saturday night (UK time). By the time, we decided to cancel tickets, it was Friday night time in India(beyond call center timings). 1. Do not buy travel insurance at the last minute. Invest some time. 2. Do not choose insurer merely based on premium. Although, in the absence of information, this is what most of us will do. 3. Take insurance for a few days beyond your return travel date, as if your extension is due to illness, some insurers may not permit extension. Similarly having it for a few days extra allows u to not get stuck due to non-working day/hrs. 4. Foreign insurers may b reasonable, but that will also require a lot of due diligence. 5. While Indian insurers do not allow taking out a policy once ur travel has commenced, many foreign insurers allow that. However i only came across such foreign insurers allowing it for their own country residents. The foreign insurance company (who are present in India through a JV too) enabled us to pick up travel insurance whilst in UK for onward travel to UAE for which I paid online using an Indian credit card and it was fully accepted at Dubai Airport when she entered Dubai from UK. The complete co-ordination on the policy is in UAE directly. In past I also had similar experience with 1) Bajaj Allianz once. 2) with ICICI LOMBARD also during our visit to USA. I wrote regarding this to Mr. Raj Pradhan about the same and my experience has been published in Moneylife. At that time also I suggested to buy insurance from destination country ( in my case USA). Even right now I am at SanJose (USA) and purchased my policy from the website http://www. visitorscoverage.com the policy being “Patriot America” a comprehensive policy for coverage of about 1 lakh USD for a one month period costing me 200 USD as the premium. Pl contact me on +1-669-253-8620 for more details. I can share my experiences with majority Indian insurance company. But the USA insurance company and few doctors here at “URGENT CARE” are equally same as India. Only a computer savvy person can deal with them. I got my claim of USD 242 reimbursed (after my 50$ deduction)and was able to get back 192$ in 2016 at SanJose. And about 135$ at Boston in 2017. Can you share the name of Insurance Co. in USA, with whom you were insured? Secondly, I am a senior citizen and would like to know if the existing diseases are covered in their policy? As citizens concerned with privacy and spamming we would urge you not to disclose your mobile number online. Please say if you would like your comment deleted. If you want to talk to me, kindly let me know if you are available on Whats App and what is the Indian Standard Time suitable to you for conversation. Yes. I am on Whatsapp, but on my india Mobile no. 98677 26090. The timings are like: 9.00 PM at SanJose is 9.30 AM in India . So your india time from 9.30 AM to 11.30 AM is ok for me. Please share link to such insurers. You may search for inward travel insurance for pretty much any country / region in the world. And they all have online chat to clear up any questions. Yes, a knowledge of using the internet is very helpful. Great information.Will look into it for details. Thanks for sharing. Thank you sir, for sharing such a valuable input. Please search by "inward travel insurance" for any country or region. Thank you for updating on Mediclaim Insurance from Overseas Insurance companies. I was informed by our agent that Foreign Insurance companies who have tie-ups with Indian companies will not give cover from their overseas offices as per their JV. Next question is about payment through credit card. Is it permitted as per RBI Regulations? Yes. You can pay your insurance premium in USD using your India issued Debit or Credit Card. Thanks Ashwin Mehta. I always buy AMERICAN insurance policy before starting from MUMBAI and pay with mainly net banking or some times with Debit or Credit Card also. No need to inform RBI. I am not aware of any such ban and I would only presume that the agent is looking after her or his own interests. There are a huge number of choices and if one JV partner refuses there are dozens of others. Better to research by way of destinations. Max Life Insurance Co. Ltd, one of the leading life insurance companies in India, announced that the company has paid 10,152 individual death claims amounting to Rs353 crore, thus achieving claims paid ratio of 98.26% in FY 17-18. This is a further increase over FY 16-17, when the company paid 97.81% of the total individual death claims received. In FY 17-18, only 178 death claims were rejected and at the end of the financial year only two cases were pending for closure. As per IRDAI annual report for FY2016-17 released in January 18, Max Life Insurance has superior individual death claims paid ratio during the said fiscal year, thus making it a company that has maintained a strong claims paid ratio consistently for the past four years i.e. from FY 14-15 to FY 17-18. Talking about the achievement, Mr V Viswanand, Senior Director and COO, Max Life Insurance said, “In line with Max Life Insurance’s vision, mission and values we have aimed at our claims philosophy to be the “fairest, fastest and friendliest” as an important pillar of TCF – Treat Customer Fairly. Through a dedicated claims officer, we also provide guidance to help claimants through hassle-free claims process. In a country which has low protection penetration, high claims paid ratio provides the assurance to life insurance customers that their families will be safe in case of any eventuality and thus encourages them to opt for pure protection products”.